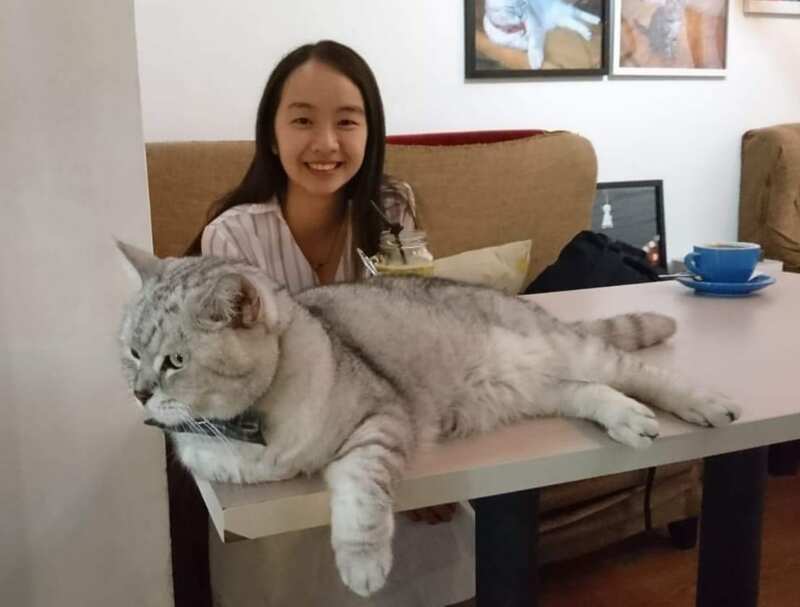 Our guest writer this week is Luca Yau, who’s set to start her PhD at Trinity College Dublin in March 2019. 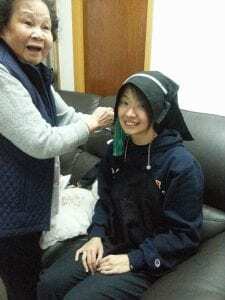 During her MPhil study at Lingnan University, Luca explored the representations and self-representations of Hakka women since the mid-nineteenth century. I was born and raised in a Hakka family, a group whose ethnicity has become marginalized and increasingly unseen in the process of rapid urbanization in the post-war period. In the 1970s, the British colonial government mandated the teaching medium of Hong Kong to be Cantonese, with the result that the Hakka dialect has been dying out over decades, losing its voice almost without a murmur. The number of Hakka speakers has declined to a worrying level, with less than 1% of the population over the age of 30 being able to speak the dialect. It was once one of the major dialects of Hong Kong in the pre-WWII period. Having grown up in a Cantonese-dominated society, my Hakka identity has been always invisible outside of my family sphere, giving me multiple identities in terms of ethnicity. Being different from the Cantonese majority, questions on what constitutes one’s identity have often come to my mind. This notion has also shaped my curiosity towards the transformation of Hakka identity in Hong Kong, and ultimately inspired the questions that would define the research I pursued for my MPhil degree. In my research, I worked on the representations and self-representations of Hakka women, from the mid-nineteenth century to the present. The first challenge I encountered in my MPhil studies was the challenge inherent in seeking a standard definition of who, or what, constitutes Hakka. This most elementary of questions has long proven to be a stumbling block for scholars who have endeavored to give a solid definition of what it means to be a Hakka. But such efforts of definition are fraught, when their validity can be so undermined by the consideration of any of the numerous counter examples which challenge any fixed criteria of Hakka identity. I later came to realize that the identity itself is fluid, floating, and extremely changeable. It is not scientifically practical to seek to define a group which is in fact ethnically undefinable; rather, Hakka identity has been historically constructed in different contexts. Images of Hakka women have tended to appear as very vibrant in historical discourses, museum representations, and the ongoing Hakka projects of Intangible Cultural Heritage (ICH). The very first Chinese historical writing on Hakka women emerged in the context of the Hakka people competing for scarce resources with the Punti people (Native Cantonese) in the early 19th century. The population had doubled between 1650 and 1800. When the relations between Hakka and Punti became tense, Hakka women were singled out for comparison with Punti women, receiving constant compliments – for having unbound feet, being hygienic, hardworking, and independent – representations which have acted to effectively constitute the characteristics of Hakka women, adding a layer of perceived glory to Hakka identity. I was intrigued by the vigorous images of Hakka women, produced as they were in what was a significantly patriarchal society at the beginning of the nineteenth century, and the fact that such images have been able to survive through the centuries, such that you can still see them predominating in the exhibitions of the Hong Kong History Museum and in the promotion of ICH on Hakka items. 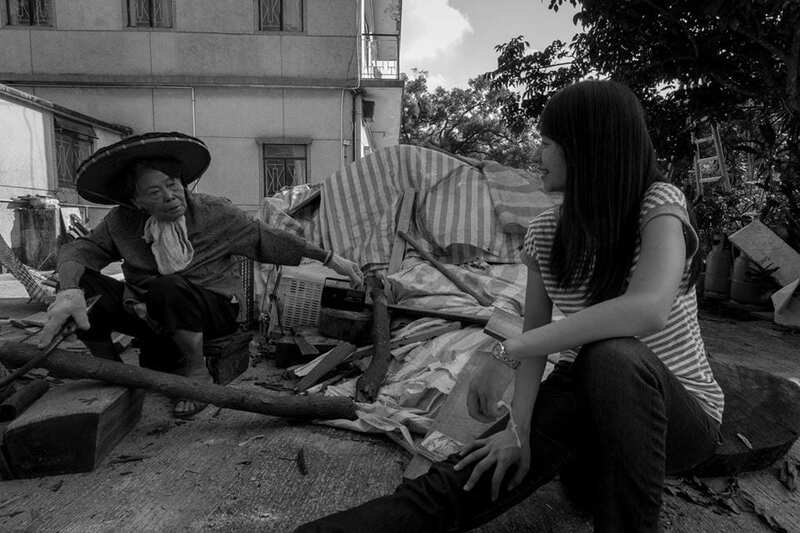 Had a casual conversation with a Punti woman speaking Weitou dialect (a branch of Cantonese) in the Northern New Territeries on 15 August, 2014. Photo Courtesy of John Choy. To examine the ways in which Hakka women have been represented, and how they have created self-representations, in museums and in the trend of intangible cultural heritage preservation, entails the employment of anthropological methodologies to enable critical access to the thoughts of Hakka women, to contextualise observations on how they are represented and how they have been given space to make their own self-representations. I was very fortunate to get to know several of the major practitioners of Hakka patterned band weaving in Hong Kong, including Tsui Yuet-ching and Choi Ching-mui, who were both invited to present their cultural practices in different kinds of media. Under the wave of intangible cultural heritage preservation, they have been afforded the chance to empower themselves and to make a voice on behalf of Hakka women. I conducted interviews with them and attended the talks and lectures that they offered to the public, the analysis and contextualization of which comprised a significant part of my research findings. In their genuine and forthright spirit of sharing, it can be seen that, even in a patriarchal society, women have had their own ability and space to express themselves and to create their own cultures through Hakka mountain songs and patterned bands in the past. In recent years, Hakka women have been enjoying the spotlight in exhibitions and activities at the center of the safeguarding of intangible cultural heritage in the public sphere, whilst Hakka men worked behind the scene to preserve Hakka culture, receiving comparatively little attention for their contributions and being unseen in the media coverage. This fact has reminded me to adopt, and to ensure, a more balanced lens in looking at the gender roles between Hakka women and men. My interviewee, Choi Ching-mui was putting a Hakka patterned band on me at her home in Sha Tin on 20 January 2016. Photo courtesy of Hulu Culture. I enjoyed the privilege of conducting interviews with the representatives of Hakka women who have endeavored to promote and preserve Hakka culture. They are happy to speak Hakka and share their past and thoughts on safeguarding Hakka culture. When we speak the same dialect, we feel as though we are culturally connected. My Hakka background has enabled me to make interpretations and observations of how they make sense of their identity, and of the revitalization of Hakka culture. My interviewees are very proud of being Hakka – in doing so, they have echoed many of the historical discourses on the Hakka people, and particularly on Hakka women, illuminating the extent to which essentialised views of Hakka women have been inherited. These are products of a historically constructed identity. The diversity that we see in Hong Kong today is mostly based on the categorization of a territory in which Chinese ethnicities have become almost invisible, as the majority of the population either speaks Cantonese or Mandarin. The various ethnic groups have become homogenized into one all-encompassing Chinese identity, one which overlooks, and forgets, the diversity that previously existed among the Chinese of Hong Kong, and the position that ethnicity once held in defining communities and identity. Further study on ethnicity is needed in order to achieve a fresh understanding of the impacts of colonial policy on the New Territories. The interactions between the ethnic groups, the changing boundaries of ethnicity, the lines between rural and urban, the impacts of urbanization on ethnic merging, and the differences of gender roles between villages and estates. Consideration of these factors offers a window into a little understood aspect of the city’s history, allowing for a more complete picture of Hong Kong history to emerge in the historical record, and for posterity. This entry was posted in Lingnan University. Bookmark the permalink.